Basically Raspberry Pi boot from SD/MicroSD card. So No other boot option provided by Raspberry Pi. 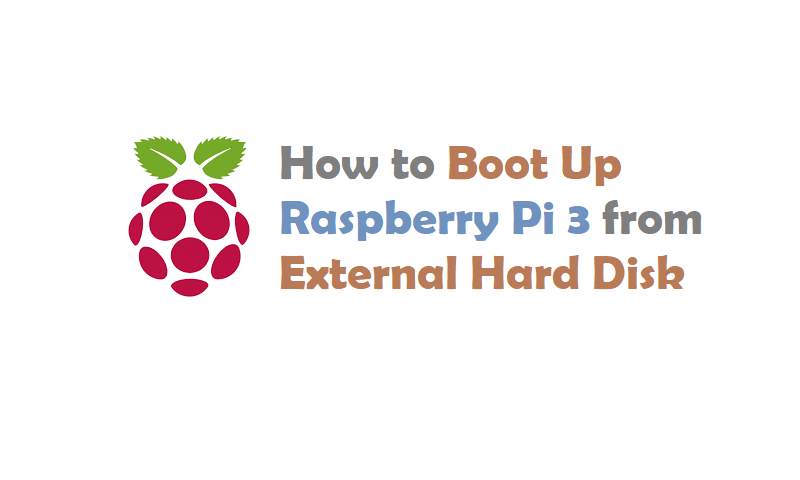 But in this post we learn “How to Boot Up Raspberry Pi 3 from External Hard Disk”. The reason Raspberry Pi 3 is used here is because it doesn’t need an additional power source to power up the external hard disk. The power supply of Raspberry Pi 3 is sufficient to power up the external hard disk via the USB port. Do make sure that you are using the official Pi power adapter or that your power plug is capable of outputting 2.5A (minimum) of current. Insert the microSD card into the Raspberry Pi 3. Plug in the external hard drive to the USB port of the Raspberry Pi 3. Power up the Pi. Once you have reached the desktop, open a terminal. Log into the root account and mount the external hard drive. Copy all the files from the microSD card to the external hard drive. We are using rsync, so all file permissions and ownership are intact. With all the boot up files in the external hard drive, we need to modify the startup file so that it is pointing to the external hard disk for boot up instructions. We need to edit two parts of this line. Change the root= to /dev/sda, and at the end, add rootdelay=5. Lastly, we are adding the hard drive entry to “/mnt/etc/fstab” so the root folder in the external hard drive is automatically mounted during boot up. Note: /devmncblk0p7 is referring to your microSD card slot and the value might differ in your case. That’s it. Reboot your Pi, and it should boot up and run from the external hard drive. One thing to note is that the microSD card needs to be in its slot, as the Pi needs to read the startup file from it before it boots up from the external hard drive. Assuming your external hard drive comes with tons of space, you might want to increase the swapfile size so your Pi can run slightly faster. Open a terminal and log into the root account. Change the value of CONF_SWAPSIZE from 100 to 512. Save and exit the file. Restart the service to update the changes.